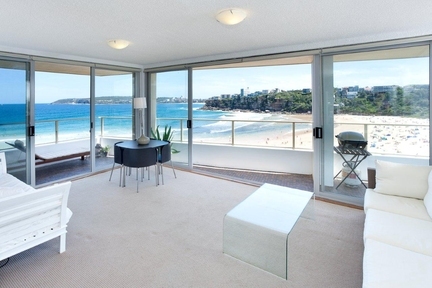 Perched directly over Freshwater Beach, commanding the most spectacular panoramic views over its golden sand through Manly to the horizon, this truly unique offering is one of a prestigious few apartments in Sydney where you can access the beach, down your own private stairs, without setting foot on the road. With a 180 degree view to St Patricks Cathedral Manly, and direct access to Freshwater Beach, this waterfront apartment is nestled on the northern end of Freshwater Beach and only minutes away from shops, eateries and world famous Manly Beach. Sit back and enjoy the outstanding views from the lounge, balcony, bedroom and kitchen. This modern apartment is fully equipped with a large TV in the main lounge with HD IQ box, and iPod dock speakers. The beachfront apartment has security parking and sleeps four people with an additional single trundle bed. Northern Beaches and perfect for families. It is the birthplace of surfing in Australia. Lifeguards patrol the beach from October to April. The secluded beach also boasts a pristine 50m-rock pool, sand dunes and a park with picnic facilities. The beach is great for swimming, body surfing, surfing, rock fishing and snorkeling.